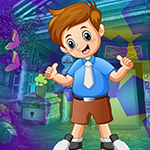 G4K Lucky School Student Escape is another point & click escape game developed by Games4King. There was a different town. A lucky school student lived in that city. There was a school where the he was studying. One day, the lucky school student got unexpectedly stuck in a room there. It is your duty to rescue the lucky school student. To help him get out of there, it will help you find the hidden clues. Find them all and save the lucky school student. Good luck and have fun! who wants to join me with posting in this thread? Thanks for all the help Alpha and others. I spent quite some time searching for the Bfly spot.